Engineered for optimum body positioning, Livestrong elliptical trainers are designed for the best in ergonomic comfort and striding motion. They are good-looking machines with big power and cool features. It’s no wonder they are endorsed by Lance Armstrong. Livestrong elliptical trainers debuted in late 2009 as the latest brand developed by Johnson Health Tech, the fitness equipment conglomerate out of Madison, Wisconsin, that also makes the AFG, Horizon, Matrix and Vision ellipticals. Seven-time Tour de France champion Lance Armstrong endorses this new line, and a portion of each purchase goes toward the Lance Armstrong Foundation in the fight against cancer. You may be able to find some older machines for sale, but we don't recommend buying them as there will be little to no customer service if you have any issues. Stick to a company that is still in business. Livestrong has adapted only the best features of the budget Horizon and high-end Vision elliptical trainers, including exciting new SIXstar Certification™ frames. This technology stems from biomechanics research done by a team of experts who designed frames and brake systems to create optimal upright body positioning and the most natural elliptical feel you will find in budget or mid-range machines. In addition, Livestrong uses better quality components than those found in competitor models at the same price level, and Livestrong’s budget elliptical trainer, the LS8.0E, features the same size frame and flywheel as the most expensive model. All of the trainers have a smooth 23-lb flywheel, Q-factor pedal spacing, 20" stride length, and entertainment systems featuring speakers and MP3/iPod® plug-in capability. The flagship of the line, the Livestrong LS13.0E elliptical trainer, offers a 30-lb flywheel, new and innovative MaxTone™ Arch Pedals, and a generous warranty of lifetime brake, 5 years parts, and 2 years for in-home service. It also features Livetrack Interactive™ Technology, which lets the user track personal fitness progress on Livestrong.com using a provided USB device. The LS13.0E offers an impressive “health club quality” feel yet is competitively priced at just $1299. With attractive consoles, strong aesthetics, great ergonomic ride, and the same quality engineering that Johnson Health Tech puts into Vision ellipticals and the redesigned Horizon EX series, the line of Livestrong elliptical trainers will be a winner for years to come. They are worthy of the Lance Armstrong endorsement. Following are specific model Livestrong elliptical reviews to give you a better idea of what the lineup is all about. You'll find in-depth specs, info, buying tips and other helpful information about each to help you make a better decision. Livestrong Ellipticals Consumer Reviews - Comments submitted by consumers who purchased a Livestrong elliptical machine. Livestrong LS8.0E Elliptical - A budget-priced trainer with the advanced features of a much more expensive model: large 23-lb flywheel, a 20" stride, dual action handlebars, and a solid non-wobble 192-lb frame. Livestrong LS10.0E Elliptical - This $999 trainer beats the competition in head-to-head comparisons with a heavier frame and the largest flywheel installed on elliptical trainers at this price level. Livestrong LS13.0E Elliptical - A steal at $1299. Delivers one of the best workout experiences in its class. Comfortable ergonomics, quiet ride, easy to use console, low step-in height. 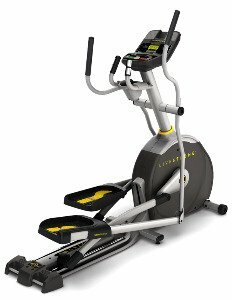 Livestrong LS15.0E Elliptical - The new for 2013 LS15.0E gets high marks from users for the natural feel and core body support. Heavy flywheel provides one of the smoothest workouts possible in this price range. Livestrong E1x Elliptical - A self-powered commercial model available for home use. The warranty is limited to 6 hours of use per day for home or light commercial use. Expensive!